There are 2 key areas for school inspections with which Moodle can help according to our clients. Moodle HQ has released 3 major versions since 2002 – the latest is version 3.3 which introduced some cool new features. It’s been 4 years since Titus Learning began providing tailored, made-to-measure Moodle solutions to schools and organisations around the world. We’ve identified 5 of our favourite Moodle plugins, just a small selection of the many plugins contributed by Moodle’s global community. There are 6 letters in the name Moodle which stand for Modular Object-Oriented Dynamic Learning Environment. There are registered Moodle sites on all 7 continents, yes, including Antarctica! There are 9 Moodle case studies available on our website, showing how schools and organisations around the world are using Moodle to enhance teaching and learning. The top 10 countries by number of registered Moodle sites are the USA, Spain, Brazil, Mexico, the UK, Italy, India, Germany, Colombia, and Moodle’s birthplace, Australia. Together these countries host over 54% of all registered Moodle sites worldwide. There are 11 key areas in which Moodle Partners provide services: analytics, consulting, courseware, development, hosting, installation, integrations, MCCC certification, support, theme design, and training. We’ve published 12 issues (so far) of the Titus Learning monthly newsletter, covering a host of e-learning topics including tip and tricks for Moodle users. Sign up on our blog page. The next Moodle release (v3.4) is scheduled for the 13th of November 2017. Moodle was the leading platform in the 2014 Survey of Technology Enhanced Learning, ahead of a variety of closed source, commercial platforms. 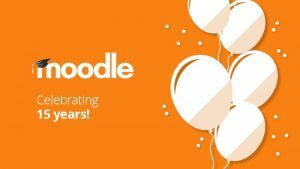 Moodle is 15 years young! Congratulations to Martin and the whole team at Moodle HQ, as well as to the millions of developers, partners, administrators and users around the world who form part of the Moodle community. Here’s to the next 15 years!